Basenjis can be extraordinary escape artists. To keep your besty secure, a martingale or limited-slip collar is an excellent choice. These types of collars are especially effective in preventing you dog from backing out of the collar. Many manufacturers make them in a wide array of colors and patterns–and with matching leashes to boot! Many owners choose to use a separate snap buckle collar to carry identification tags. Sighthound (or lure coursing) collars typically are like martingales, but wider and sometimes padded to protect the neck/throat, limiting or eliminating gagging. 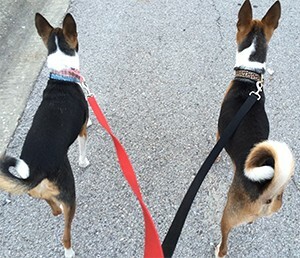 Basenjis who pull a significant amount often pull less when walked with a very wide collar. Leashes come in different lengths for specific purposes. The average leash for walking is 5 to 6 feet long. A 4 foot leash is good for vet visits or other times when you want to keep your dog close and in control, such as when close to traffic or in a highly populated area. The leash material is important, especially for Basenjis. We recommend sturdy material to avoid a dog-initiated ‘chew release’. Some Basenjis will require an inch wide leash to minimize the potential to chew through in just one or two bites. Double layered leashes also can be effective. Chain leashes prohibit a chew through escape, but are heavy and unsuitable for everyday use. A word about the notorious retractable leash… The retractable leash has gotten some bad press–and rightfully so! Some types, especially the cord type, are dangerous and pose risk of serious injury to both dogs and walkers. Another disadvantage is that it’s easy to lose hold of the handle–which instantly retracts toward your dog–as there is no loop to envelope your wrist like a conventional leash. And if your Basenji finds himself under a ‘handle assault’, you can bet he will bolt, with the handle clattering behind spooking him onward. And as if all that were not enough, retractable leashes are known to come apart when a Basenji hits the end of the line. Don’t be fooled into thinking harnesses are escape proof. Yes, we have witnessed some some of our ‘Houdini’ dogs slip out of harnesses. Good fit and proper adjustment are essential to their effectiveness–ensure both BEFORE you take your B out. But exercise caution: some clever Bs can escape even properly–or tightly–fitted harnesses. What’s more, all harnesses are not created equal. This one from Ruffwear has a strap closer to the Basenji’s waistline that helps to keep it secure. And this new Harness Lead is touted as escape-proof and an impediment to pulling. It works well for many Basenji owners. Some harnesses (Easy Walk, Halti, Sporn) are designed to keep your dog from pulling. There are other tools, like head halters (or head collars) and the Gentle Leader, that offer the same promise. Exercise caution with many of them, however, since our clever Basenjis can escape by backing out or ‘wiping off’ head collars. Be patient if you train your Basenji to use a head collar. Make it fun and keep him moving. These collars have a different, confining feel to the dog that requires an adjustment period.